I love the colors and so many great details on this layout! Thanks Jolene for sharing!! We love having you as part of our team!!! REMEMBER!...i will be posting the winners of our challenge later on in the week! In memory of hard work..WINNERS!!! Sorry it has taken a bit to announce our 10 random winners from the "in memory of hard work" post! Thank you so much for your help in trying to track down this book! :) We hope it will be returned!! Anyways... back to the winners!!!! Please email me at megan@fancypantsdesigns.com with your mailing address, so i can get a fun prize package out to you!! Thanks again for being patient!! Hey everyone!! We want to thank you all for being so patient!! We have had the hardest time selecting the newest 5 members of our team! You are all SO talented and each have such a unique style!! Anyways... i know you are all dying to find out who we have chosen!!... The winners will be be posted BY tomorrow night... so check back often! :) Thanks again!! Hey everyone! I hear some of you are having troubles getting your emails to go through?! I have been emptying out my inbox on a regular basis...so keep trying! If you can split up the images in separate emails, that is ok too! The emails are big, and i am getting quite a few... i think my computer is a little overwhelmed! Also, if you are worried, put a send receipt with your email! That will let you know as soon as i open it!-then you wont have to worry! Thanks again, and good luck!! Wow!! I cant believe the response we have gotten for our Design Team call! You all seriously have so much talent!! It is so fun to see everyones unique style!! 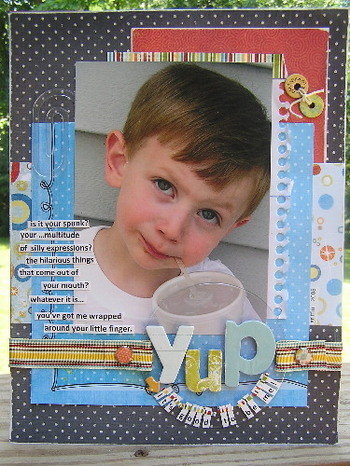 This layout was created by Vicki Chrisman!! Don't you just LOVE The Daily Grind line?! Once again... this is the Daily Grind line! 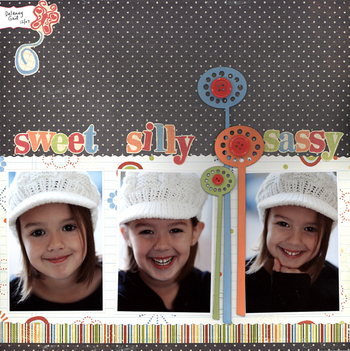 This super cute layout was made by Michelle Coleman! Not only did Michelle create the layout, she designed the DAILY GRIND line! Thanks Michelle!! 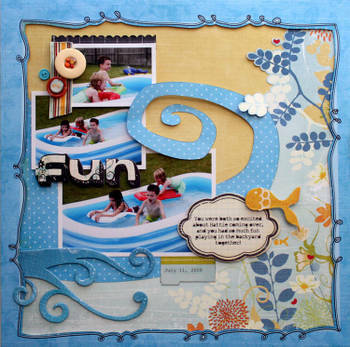 Jeri Hoag created this layout! I love the black paper!! Jeri was also at the show with us!! It was so fun to get to know her better! I feel a challenge coming on!!! We need to get some of this awesome new product out to a few lucky people before they hit stores!! Keep checking back.... you wont want to miss this!!! I hope everyone is having a great summer!! We just wanted to remind everyone...starting now and until AUGUST 10th, feel free to send in all of your fabulous entries!! We are so excited to see all of the talent you each have, and to have a complete design team!!! Check back on Wednesday for projects made with our newly released products!! !